By Tom Ritchie (Sage One Customer Support Team). We’ve set up a brand spanking new Sage One Support Team who are now all in place and ready to support our Sage One customers. My name’s Tom, I’m part of the team and I’m going to write a little about the rest of group and my experience of building what the Sage One Support Team looks like now and our aspirations for the future. The start of training involved the usual teambuilding stuff that makes most people cringe and after finding out that pretty much everyone wanted to skydive before they die, we started talking about culture; specifically about what we wanted our culture to look and feel like. We looked at cultures within different companies including Google, Rackspace and Apple and had an in-depth discussion around what those cultures represented and how they impacted the people who worked there and their customers. It was at this point that it became apparent that every member of the team was passionate about one thing; making our customers happy. There was only one place to find this out and that was from our Sage One customers, so we decided to call them for a chat. This is something that excites me about the new team – the fact that we are offering a proactive service in order to truly engage with our customers and, if we need to gather feedback in order to improve, we’ll go straight to the people that matter. After talking to our customers and looking at the feedback we had collected, we made a decision to make some promises around what we were going to offer and deliver. We decided it was important that our customers saw this so they could hold us accountable for fulfilling the promises we make. 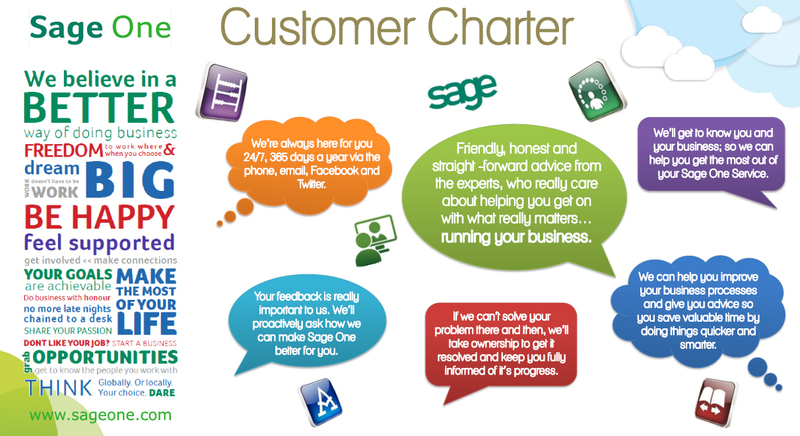 We came up with the Sage One Support Customer Charter. This was just one part of our training but I feel it was the most important aspect. Our Customer Charter is something completely new and it was created based on what our customers wanted from their service. I’m personally looking forward to my future with the Sage One Support Team and delivering world-class support to our customers! If you haven’t yet experienced it for yourself, give us a call on 0845 111 66 11 or email us at support@sageone.com – we’re here for your 24hrs a day, 7 days a week, 365 days a year!